Part of getting over it is knowing that you will never get over it. “What were they thinking?” is a favorite magazine and tabloid newspaper heading often used as a commentary over funny or bizarre photographs. But frequently when I think of the Swell Dames that I admire, I find myself wondering the same thing. What were they thinking? And what were they feeling as they faced the challenges, crossroads and choices that ultimately changed and shaped the trajectory of their lives? Were they preparing dinner when their lover walked into the kitchen and said, “We need to talk”? Did their knees buckle when they realized that everything they’d worked for their entire lives was wiped out in a day because they trusted a con man, their own husband? What were they feeling as they watched their dream house float down the street in a once in a thousand year flood? After Noah’s Ark, God promised never to destroy the world again with water. Just don’t try “comforting” a woman from Texas or Florida right now with that biblical reference. Better yet, say nothing other than a prayer for what they are enduring, offer gratitude that you’re not and make a donation to the Red Cross. Because there are no words when sorrow slaps you senseless with a sucker punch. There’s no self-help mantra, nor belief big enough to surmount the anguish at this moment. When the day after tomorrow arrives at each of our doors, and it will, there’s no metaphysical “Secret” on earth to help you come to grips with the unfathomable. All we know is that we are shocked, stunned, hurt, grieving, and groping with too many unknowns to consider and too many contingencies to handle. And that is where my own Swell Dame found me to have a little chat. Setting the dominoes up. It went something like this. You will never get over losing Newton’s Chapel. Eve never got over losing Eden. But the only way you can move to the future is by being grateful that you once lived in Paradise and you created a beautiful Home there. The dream of Newton’s Chapel is your dream of home. You can create a new home for us. I’ll help you. There are some things we are not meant to get over. Sometimes we hold on to the grief of the Past because it’s the only way we know how to hold on to the ashes of Love. That’s why I writing to you this week because I’m sure I’m not the only woman who’s shut herself down in order to shut her inconvenient emotions off from whatever we can’t face or accept just yet. I’d not even let myself cry really because I was afraid that once I started I wouldn’t be able to stop. But the Compassionate One has already intervened on our behalf. The Talmud tells us “Even when the gates of Heaven are closed to prayers, they are open to tears.” Far from being self-indulgent, crying is an ancient form of articulated prayer. In Catholic and Eastern Orthodox religions, tears have always been a special gift of the Holy Spirit; in the Hebrew Old Testament, an entire book of the Bible is devoted to crying—the Book of Lamentations. For centuries in the west of Gaelic-speaking Ireland, particularly in Connemara, certain women, wise in the ways of the supernatural or “other” realms were taught the proper way to grieve with sound, or keen, which is a long, high-pitched wail of abandonment and grief strong enough to shatter glass. The language of keening is the passionate calling forth of exactly what it is that you dread and fear, to rise up and meet you face-to-face on the scorched battlefield of your devastated heart. The sob is the soul’s sacred battle cry for the Beloved to intervene, to help, to have mercy, to deliver you. To carry you off the battlefield. To bring you Home. To keen is to embrace those emotions too deep and too dark for words, struggling now for some, any form of expression. To let the sound of sorrow and waves of grief pass through you, picking up tempo and timbre as you go, is like breath on the reed of a woodwind or strings of a violin. To truly cry takes tremendous courage. A fiery anger wrestles in the pit of your gut; the despair catches in your throat; the fierce loneliness of the iron band of sorrow tightens across your chest. Many of us resist the sacred relief of crying because the truth is, the act of crying physically hurts. Heartache is real. But we must trust that it hurts for a reason. We feel so alone. Bereft. We can’t go on we tell ourselves. But we must go on, we must take the next step, any step. 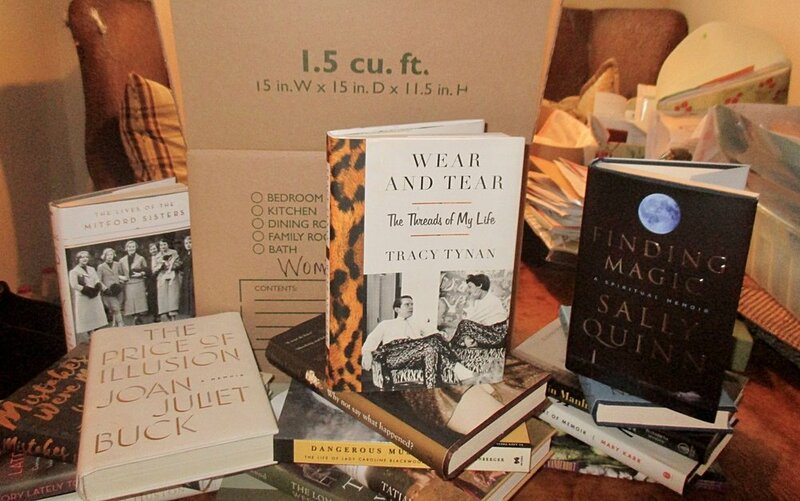 Fill an empty box with your cherished books. For the love of all that is holy, do you really believe that God would leave us alone at such a moment? I don’t. I won’t and you can’t either. Because how else could we go on? And go on, we must. But I’ll never hush you, Sweetheart. I’d rather you howl at the moon. Heaven knows that I have. Puree the cucumber in a blender and strain the juice. Mix the teas together and add the cucumber juice. Stir well and refrigerate for at least half an hour. This mixture will keep a day or two in the fridge. If you’ve been crying on and off, dab your face with some, rinse with cool water, and then pat your face dry with your softest towel. Also have on hand a pitcher of water with cucumber slices and drink from it frequently. Often when we’re emotionally distressed and wrung-out, we forget to do things as simple as sipping water while we slosh back the wine and whiskey. Reach for the water first, because dehydration can make you swoon.